I love this game. It's basically a Guitar Hero remake but, all the songs are really good metal songs by bands I've personally never heard of. 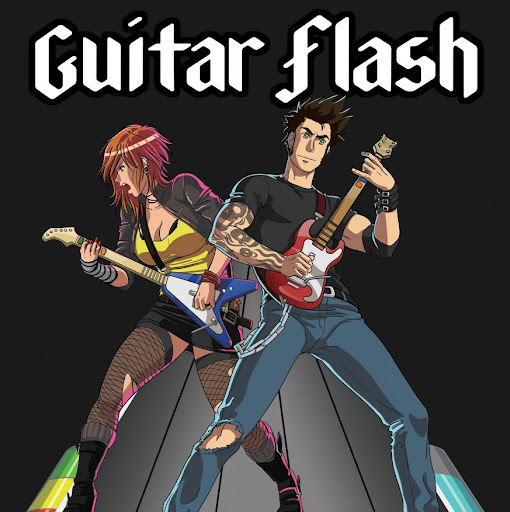 I recently tried pretty much all the Guitar Hero clones on Google play and all but this one sucked in one way or another. Guitar Flash is really good at making all the dots match the actual rhythm. The songs are very challenging and can be made more or less challenging by choosing between 3 and 5 "strings". Unlike the other GH clones for Android this version is in landscape orientation. Personally, I think it makes the game more friendly because it's easier to use 2 hands. There is nothing to buy but, at the end of every song you have the option to get one gold coin for nothing or 5 gold coins for watching a 30 second video. You start with about 5 songs but after you win a song new songs are unlocked and you use the gold coins to buy them. Usually I would hate this way of doing things but the songs are so good and long that by the end I don't mind putting down the phone for 30 seconds while some ad plays. The unlocked songs are either 5, 10 or 20 gold coins. I think it's balanced pretty well. You can get a decent amount of songs unlocked and "bought" without having to replay songs. If you have an Android device and love metal you should check this out. You won't be disappointed. Last edited by MadGypsy; 04-29-2017, 08:16 PM. If you have a browser with flash enabled you can play in that browser. It's a little better than the Android way cause you can just pick any song and skip all the gold coins part. There are a lot of well known songs apparently. I haven't gotten far enough in the Android version to unlock more recognized and popular bands.